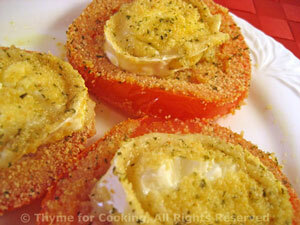 Chevre (Goat Cheese) and Tomatoes, easy starter from Thyme for Cooking. In summer we have fresh Mozzarella di Bufala with garden ripened tomatoes. This is the late winter substitute. Slice cheese into 6 rounds. Each round should be between 1/4 and 1/3" (.75 - 1cm) thick. Cut 3 slices from each tomato. Mix bread crumbs, garlic, basil and put onto a plate. Put olive oil on another plate. Dip both sides of the tomato slices in the oil, then the crumbs and place on a nonstick baking sheet - leaving room for the cheese slices. Bake, 400F (200C) for 10 minutes. Remove baking sheet, leaving tomatoes in place. Dip both sides of the cheese in the oil, then the crumbs and place on baking sheet. Return sheet to oven and bake 2 - 4 minutes longer, just until you see the tops of the cheese sink slightly. Remove the tomatoes to 2 plates. Carefully remove the cheese and place on top of the tomatoes. Serve.